Description: Ancient Khmer goldsmiths practiced two distinctly different methods of gilding, a mechanical method called foil gilding and a chemical technique known as amalgam-gold gilding. 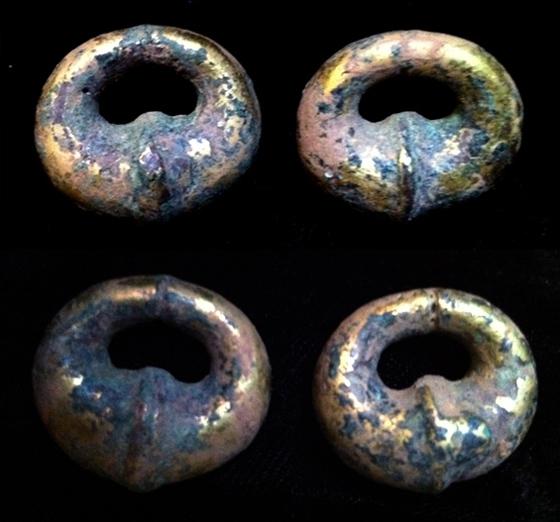 These earrings are casted copper and covered with gilded gold (amalgam-gold gilding method). Bunker, Emma C. & Latchford, Douglas . Khmer Gold - Gift for the Gods. Chicago (USA): Art Media Resources, 2008. "Khmer Goldsmiths' Techniques", Page 129.